January is no more, and I am stunned by how quickly those 30 days passed by. The first month of the year is probably my least favorite of all twelve, but I can’t quite put my finger on why that is. It might be the boring January food magazine issues, with uninspiring covers focusing on post-holiday diets and low calorie foods. Perhaps it’s because of the cold that seems to set in here in northern Florida during that month. If weather is the reason why, then I should have loved this past January — out of all the days Mother Nature had to play with, only two saw temperatures drop below a high of 60 degrees. The rest of the time, we enjoyed the warmth of highs in the 60s to the low 80s, and I had to repeatedly explain to my puzzled children why they weren’t allowed to go swimming in our community’s pool yet. Every where I look, I see trees trying to bloom, confused by the warm weather we’ve had. The young maple trees that line our side street have newborn leaves popping out on their spindly branches, and when I got in my minivan at the airport after arriving home from Birmingham on Sunday, I found my van covered in the powdery yellow pollen from the oak tree branches overhanging the lot. And, for some reason, the Bradford pears seem to be the most confused, having just lost their leaves for the winter. My weekend in Birmingham this past weekend was a little cold weather escape for me. I was able to wear sweaters and my new puffy white coat all weekend. I was even surprised by ice on my windshield on Sunday morning, when I got in the rental car to head to the airport. I could have done without the ice, but the crisp weather was a nice change from what I’m used to. This coming weekend, I’m in for an even bigger taste of cold weather when I head up to New York City for a medical conference. I won’t mind the 40 degree weather one bit since I’m going to one of my favorite places on earth. Born and raised in the south, I somehow manage to feel like a New Yorker every time I visit – and the feeling persists for months after I return home. My love for the Big Apple is so apparent to my husband that Sam has even asked me a couple of times whether we should consider moving up there. Don’t worry, Mom. We’re not moving anytime soon. 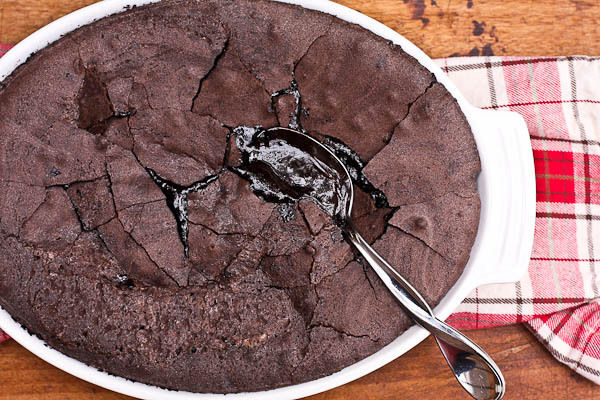 None of this really relates to this recipe for Chocolate Brownie Pudding except for the fact that the dessert will certainly warm you up on a cold night. Plus, it’s so darn good that I just couldn’t keep it from you any longer. I tweaked the recipe just a bit from a recipe from Ina Garten’s Barefoot Contessa Back to Basics – a great cookbook if you don’t own it already. Now, in full disclosure, my non-chocolate loving husband was not overly impressed by this dish. It was just too rich and, well, chocolatey, for him. 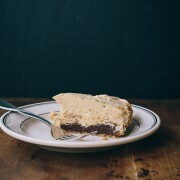 Which means that it is the best dessert ever to serve to someone who adores chocolate. Like me. When you take the casserole dish out of the oven after it bakes for an hour, the top of the surface is flat and smooth, hiding the gooey goodness just below the surface. Cracking the top by pressing gently with the back of a spoon reveals the glossy inside, showing just a hint of the molten chocolate below. 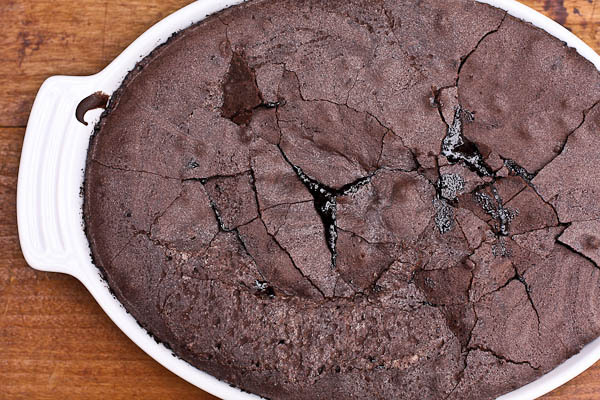 The dessert — not quite a brownie, and not quite a pudding, but a nice blend of the two — has a texture that makes you think it’s not been cooked long enough. A couple of spoonfuls of this, either warm from the oven or warmed in the microwave, with a scoop of vanilla ice cream will satisfy every dessert craving you didn’t even know you had. Unless you’re like my husband. After baking, the top will look fully cooked but the center will appear to be underbaked, and this is to be expected. 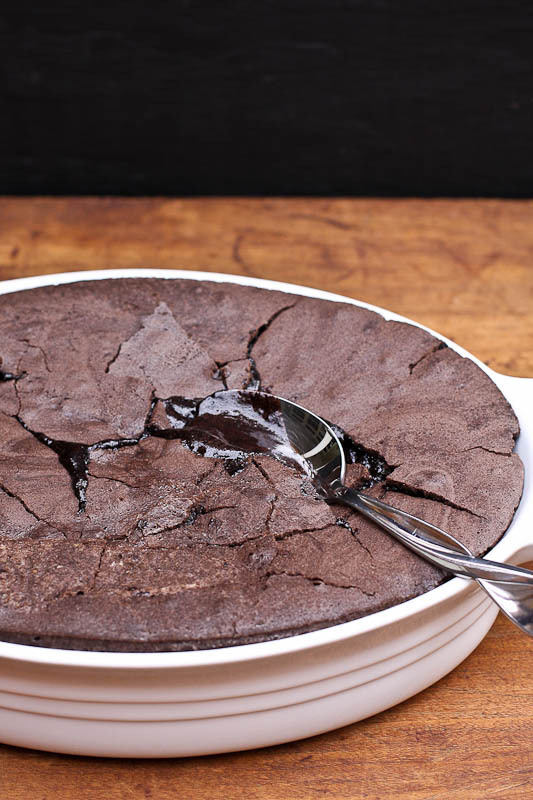 The texture should be like a cross between an brownie and a pudding. 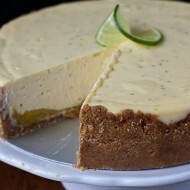 Serve this by the spoonful - or spoonfuls - with a scoop of cold vanilla ice cream on top. Preheat oven to 325 degrees. Butter a 2 quart baking dish. Melt the 2 sticks of butter and set aside to cool. With an electric mixer fitted with the paddle attachment, beat eggs and sugar on medium high speed until very thick and pale yellow, about 5 to 10 minutes. Meanwhile, whisk together the cocoa and flour and set aside. When the egg and sugar mixture is ready, decrease the speed to low and add vanilla extract, Grand Marnier, and the cocoa and flour mixture. Mix until just combined. With the mixer still on low, slowly pour in cooled butter and mix again until just combined. Pour the batter into the prepared baking dish and place it in a larger baking pan or roasting pan. Add hot tap water to the pan to come halfway up the side of the baking dish. Bake for 1 hour. Allow to cool some; serve warm or at room temperature. Minimally tweaked from Ina Garten's recipe in Barefoot Contessa Back To Basics, 2008. Your soup recipe looks wonderful (even without Oliver’s rice LOL). Great before and after photos of the tomatoes too by the way. Enjoy your few days at the Culinary Institute! I went and visited your new blog. I think the idea is fantastic (!!!) I know that you will reach so many people that need so very much to read what you will post. You are wonderful for having created Eating Despite Cancer. My mom always put corn cornels in my tomato soup. Now it just doesn’t taste right without the corn. What?! Wow! I am so excited that Oliver has developed a liking for tomatoes, though the addition of rice on the bottom is a little interesting. I am so glad to see your new blog, MJ. I know that you will have a real impact in that space – food and cancer is another battle in and of itself. I remember too well from my parents’ fights how terrible the illness can be, especially to those who love food. Especially to those who need the nourishment. I’m looking forward to following you there as well. Nothing, but nothing is better than tomato soup. With or without rice. But always with grilled cheese! I’m with Gail – grilled cheese and tomato soup – I could live off of that!!! And go you with the new site. You’re an inspiration. I love roasted tomato soup. This looks so delicious. Perfect for cool fall days! This soup looks lovely! Tomato soup is one of my favorites, and roasting the flavors adds so much great flavor! I love tomato soup in the winter time…..especially when we make our famous grill cheese! The grill cheese is perfect for dipping. Yum! This recipe sounds scrumptious. 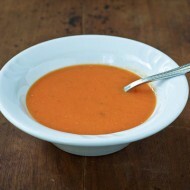 I love tomato soup – the kind without rice too ; ). It takes me right back to being a kid! Made it yesterday – with yellow tomatoes. Delicious and beautiful. Thanks!